Pim is a baby aardvark with a long, furry nose. He has tiny little claws instead of fingers and toes and sleeps in a cosy burrow. But he isn't sure what being an aardvark really means. He asks his mother all sorts of questions, and she decides it is time he found out what being an aardvark is all about. In his quest to discover the world around him, he meets lots of exotic and interesting animals. There are snakes, cheetahs, elephants, and monkeys, and they all have something to teach him. He's disappointed that aardvarks can't climb trees, but as he learns how to find termites, fight predators, and build a burrow of his own, Pim realises there are some advantages to being an aardvark after all. This is a heart-warming story from best-selling author Jill Tomlinson, whose books have been hugely popular for nearly 30 years. Told in clear, simple language, they are ideal for young listeners, who can identify with the baby animals and their attempts to find out who they are. The Aardvark Who Wasn't Sure is bound to appeal to children who love animals or are curious about the world around them. 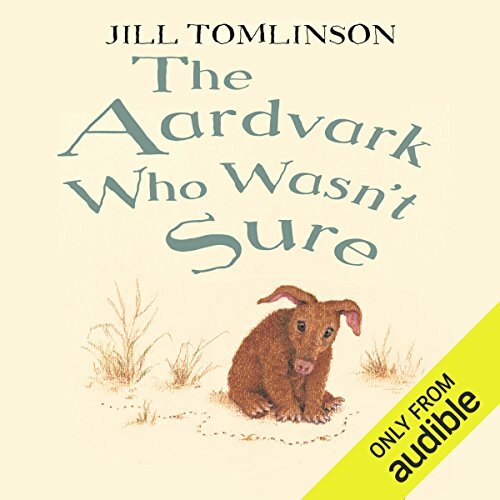 ©2004 Jill Tomlinson (P)2014 Audible, Inc.
My 3 year old loved this. Nice story that was interesting but not too difficult to follow. Good vocabulary.